One of my favorite books is Edmund White‘s “The Beautiful Room is Empty.” I found it in a small North Carolina library quite by accident when I was an adolescent. It was the first book I had found that dealt with being a young man and being gay (that wasn’t some scary psychology textbook decrying homosexuality with mental instability). I remember reading that entire book in the library for fear of my mother finding it if I took it home. I was hungry for some kind of reflection of my existence. I needed to know that someone else had gone through what I was going through. That book (and Sylvia Plath’s “The Bell Jar” were pivotal in my development of accepting myself. 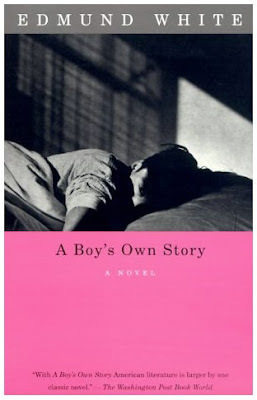 So, when a friend of mine offered me their copy of “A Boy’s Own Story,” I was definitely interested. The cover proclaims that it is “the best American narrative of sexual awakening since Catcher in the Rye.” I didn’t let that stop me from reading (I don’t have happy memories of that book from AP English). It took me longer to read than I thought it would. One reason is because the book is very much a memoir type of telling. The adult is recounting his story as a boy and many of the stories are embellished with how the adult feels about them “now.” I liked this aspect of the book because it gives the reader some sense of the gravity that these moments have and it shows what the narrator feels he has learned. Another reason it took me longer than usual to read this book is that the adult narrator loves his big words. Now, I like to think I have a pretty good vocabulary, but White had me reaching for my Webster’s so often that I think I must have read this book twice (I kept forgetting the context of the word after I looked it up and then I had to reread the passage). Do you know the meaning of calyx, carbolic, and mendicancy? What’s truly amazing about this book is how deftly White draws portraits of every character. The stoic father, the mercurial mother, the bratty sister and the aloof boys could easily become stereotypes. Not in this book. White gives the reader nuanced descriptions, psychological insights through dialogue and action. No one is simply a monster even if they do hurtful things. Conversely, no one is a saint either, regardless of their naivete. The story never goes where you think it is going. The whats and wheres aren’t as important as how it all makes the narrator feel, how it informs his choices. White knows how to create a convincing setting that contributes to the actions of the characters. I was there with the boy in the houses of his mother and father. I was witness in the boy’s dormitory, the parks and churches. I felt as if I understood his inner workings of his heart and mind. “I hypothesized a lover who’d take me away. He’d climg the fir tree outside my window, step into my room and gather me into his arms. What he said or looked like remained indistinct, just a cherishing wraith enveloping me, whose face glowed more and more brightly. His delay in coming went on so long that soon I’d passed from anticipation to nostalgia. One night I sat at my window and stared at the moon, toasting it with a champagne glass filled with grape juice. I knew the moon’s cold, immense light was falling on him as well, far away and just as lonely in a distant room. I expected him to be able to divine my existence and my need, to intuit that in this darkened room in this country house a fourteen-year-old was waiting for him. “Sometimes now when I pass dozing suburban houses I wonder behind which window a boy waits for me” (39).